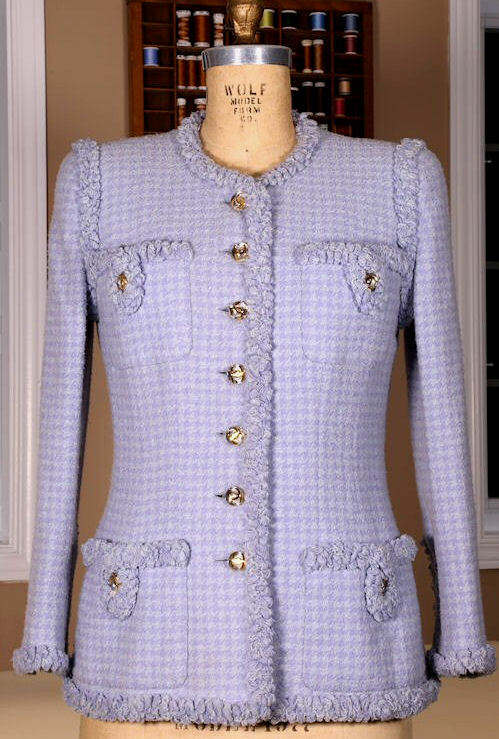 During her comeback years in the early 1950s, Coco Chanel introduced the classic cardigan suit. The jacket was usually made from soft bouclé or tweed fabric. Lightweight and unstructured, often without a collar, it was as comfortable to wear as a cardigan sweater. The hallmark features, which we still recognize today, include braided trim, patch pockets, gold buttons and a gold chain stitched into the hem. For almost sixty years the cardigan jacket has been a versatile wardrobe staple, copied by just about every designer you can name, a style that can easily transform from a casual coordinate for jeans to an elegant jacket for an evening out! I have been interested in the construction of this time-honored garment for a number of years. 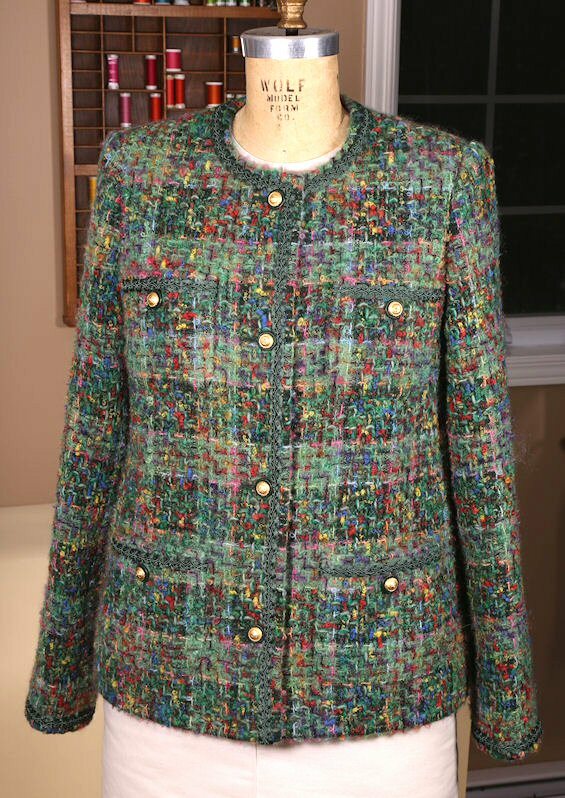 Over time I have been fortunate to acquire a small collection of these jackets: a quilted Chanel jacket from one of the first pret-a-porter collections of the late 1970's, a late 1980's couture garment, a 2001 ready-to-wear garment , and a few other ready-to-wear garments. 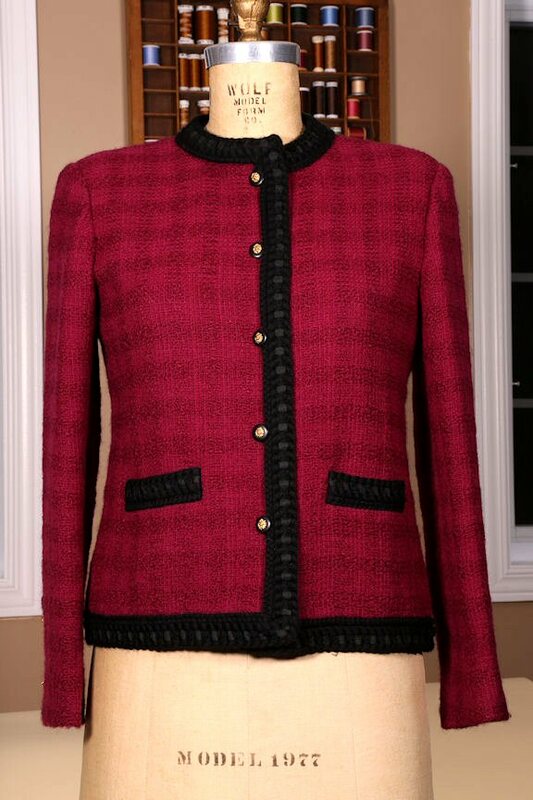 These treasures have provided a wealth of information on how the original garments were made, and this article will focus on techniques I use to achieve the style and look of this iconic cardigan jacket. I have combined couture techniques learned from Claire Shaeffer, British couturier Jon Moore, and Savile Row tailors with machine and ready-to-wear techniques. I personally enjoy handwork and the control that it provides, but not all of us have the time or inclination for such refined and detailed work, so you may wish to adapt some of these techniques to your preferences for couture vs. machine techniques.